IMI Systems had already been considered a cluster munitions producer and had been included on PAX’ long list of cluster munitions producers in recent years. However, as we could previously not find financial links with the company because it was state-owned, IMI Systems was not included in previous versions of this report. Early 2018, it was reported that Elbit Systems would take over IMI Systems[i] and in August 2018 it was reported that the merger passed the checks by the Israeli Antitrust Authority. [ii] At the time of writing it is likely that Elbit will acquire IMI Systems before the end of 2018. Below we will list the cluster munition-related activities of IMI Systems, which at the time of writing still maintains a separate website. [iii] With the acquisition of IMI Systems, Elbit Systems will become the parent company of a cluster munitions producer and will therefore be regarded as a cluster munitions producer itself. Therefore, we provide this information to inform investors in Elbit Systems that it is to be considered a cluster munitions producer after the acquisition of IMI Systems. IMI Systems is considered a cluster munitions producer because there is sufficient evidence that it produced cluster munitions after May 2008, amongst others the M85, M970, M971, RAM cluster munitions and the EXTRA system with cluster-munition warhead. It also continues to advertise several types of cluster munitions, including the EXTRA system. IMI Systems´ new parent company Elbit Systems has declined PAX’ requests for more information and did not state publicly that it would stop producing cluster munitions. As a result, Elbit Systems is considered a cluster munitions producer because of its acquisition of IMI Systems in 2018. We call on Elbit Systems to fully end its involvement with (key components of) cluster munitions. We also call on investors in Elbit Systems to engage with this company to make it sever all its involvement with the production of cluster munitions. Elbit Systems is not yet included on the 2018 Red Flag List because the acquisition was not yet completed at the end of the research period of this report. However, we list the financial links with Elbit in Appendix 1 and in the Hall of Shame Table under Elbit on this site. The yellow-coloured diamond-shaped markings can be seen near the nose of the projectile with the 120mm M329, the 122mm M335, the 130mm M347, see IMI, “IMI Systems ‘What we do?”, IMI website (http://www.imisystems.com/whatwedocat/firepower-precision/land-firepower-precision/artillery/), last viewed 15 October 2018. [i] Reuters, “Israel’s Elbit to buy Uzi maker IMI for $523 million”, 13 March 2018, Reuters website (www.reuters.com/article/us-elbit-systems-imi-m-a/israels-elbit-to-buy-uzi-maker-imi-for-523-million-idUSKCN1GN0DK), last viewed 9 April 2018; Haaretz, “Elbit to Buy Uzi Maker IMI in Major Israeli Defense Merger”, 12 March 2018, Haaretz website (https://www.haaretz.com/israel-news/business/elbit-systems-to-buy-imi-in-major-israeli-defense-merger-1.5891233), last viewed 25 October 2018. [ii] Globes, “Regulator approves Elbit-IMI merger”, 20 August 2018, Globes website (https://en.globes.co.il/en/article-regulator-approves-elbit-imi-merger-1001250683), last viewed 25 October 2018. [iii] IMI, “IMI Systems ‘What we do?”, IMI website (http://www.imisystems.com/whatwedocat/firepower-precision/land-firepower-precision/artillery/), last viewed 15 October 2018. [iv] IMI, “About us”, IMI Systems website (www.imisystems.com/about-us/), last viewed 9 April 2018. [vii] Jane’s Air Launched Weapons, 2018-2019, p.518. 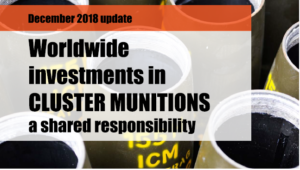 [viii] Cluster Munitions Monitor 2018, “Israel Cluster Munition Ban Policy”, Last updated 2 August 2018, Cluster Munitions Monitor website (http://www.the-monitor.org/en-gb/reports/2018/israel/cluster-munition-ban-policy.aspx#ftn17), last viewed 20 September 2018. [ix] IMI, “EXTRA Extended Range Artillery”, IMI website, viewed 4 January 2018. Later in 2018, the website information about the EXTRA system was changed and the payload option ‘sub-munitions’ was removed from the description, now calling the EXTRA the Extended Range Artillery Rocket Systems, see IMI, “EXTRA Advanced Long Range Fire Power System”, IMI website, (www.imisystems.com/wp-content/uploads/2017/01/EXTRA-1.pdf), viewed 9 April 2018. [x] Miroslav Gyurosi, EXTRA guided rocket offered as a naval weapon, Jane’s International Defence Review, July 2014, p. 16. [xi] Elbit Systems, written response to PAX dated 23 May 2018, on file with PAX.